We’re all guilty of it at some point; the infamous selfie. We take selfies for fun, silly ones to send to our friends, cute ones to send to a crush, and suddenly it feels like we’re taking selfies all the time. But where do we draw the line between a regular selfie taker and a selfie addict? Selfies are standard now, nearly everyone you meet knows what a selfie is and has taken one themselves whether or not they like to admit it. In the world of smartphones and constant social media with apps like Snapchat and Instagram, these photos are inescapable, but what are they really doing to our mental health and well-being? Learn how your teen can avoid a negative digital footprint. A selfie is a self-taken photograph, usually from a smartphone. Selfies can be achieved either from holding out your phone or camera, by using a selfie stick, or taking a photo using a mirror. Selfies can be taken solo or packed with friends and family. According to the Public Domain Review, the selfie was first invented in 1839, but these photos have exploded in popularity in the last few years due to advancing smartphones with front-facing cameras and fun social media apps like Snapchat. Selfies have gotten so popular in the last decade that the Oxford English Dictionary declared “selfie” as the word of the year in 2013. Apps like Snapchat also allow you to apply all sorts of filters that smooth your skin, change your face shape, turn you into a dog, and many more options. What is a Selfie Addiction? We know what you’re thinking: How can taking fun selfies go too far and become an addiction? This is easier than one would think as today’s online world can easily lend itself well to obsession and narcissism. And why wouldn’t it when we spend lots of time looking at ourselves through filtered lenses from only the best angles? We then take these selfies and post them to social media to watch likes and comments filled with praise add up. Qualifying as a selfie addict means not only stopping to take selfies at any occasion, no matter the appropriateness, but then the selfie taker goes on to place their self-worth on the reactions of their friends, family, and strangers on social media. In 2014, a satire article coined the term selfitis as a joke, commenting on the pervasiveness of the selfie in mainstream culture. While at the time of this article, selfitis was not truly classified as a mental disorder, this article and the idea of selfitis later prompted researchers at the International Journal of Mental Health and Addiction to study selfitis in 2017. The original satire article had defined selfitis in 2014 as, “the obsessive compulsive desire to take photos of one’s self and post them on social media as a way to make up for the lack of self-esteem and to fill a gap in intimacy”. Based on this, the real study went on to look at the different levels of selfie taking obsessions and identified six reasons behind it: “environmental enhancement, social competition, attention seeking, mood modification, self-confidence, and social conformity”. Do you often spend more time taking selfies than you mean to? Would you find it very difficult to make it through a day without taking a selfie? Do you spend a lot of time thinking about selfies or planning how you will take selfies? Do you feel an urge to take selfies more and more? Are you taking and posting selfies in order to forget about or avoid doing other things? Have you tried to cut down on the amount of selfies you take without success? When you post a new selfie, are you very disappointed if no one comments on it? Do you take selfies so much that it has had a negative impact on your relationships, job or studies? Do you imagine everything you do as a selfie? Does posting selfies make you feel more important? If you answer yes to 2-4: It’s time to become a bit more conscientious about when you take selfies and why you’re taking them. Over the next week, play close attention to this and find an accountability buddy to help you curb your selfie enthusiasm. If you answered yes to over 4: This is bigger than a display of self-love and appreciation as there’s likely a deeper issue here. According to MsCareerGirl.com, “you are using short-term gratification at the expense of more important goals.” It’s time to come back to reality and away from the virtual simulation that requires a constant fix of approval and praise. A picture will never capture who you are nor how great you are. Remember: the best things in life can only be experienced in person. What Else Should I Know About Teen Selfies? Selfies are fun and can be a good way to preserve memories and communicate with people but too much of anything is never a good thing. Teen selfies and social media apps like Instagram and Snapchat are impacting adults, teens, and younger children more negatively than it first appears. According to a Pew Research Center study in 2018, 72% of all teens were using Instagram and 69% were using Snapchat. Being two of the most popular social media apps as well as two of the most popular selfie apps, means that teens are taking and consuming more selfies than ever before and there are a few things parents will want to be aware of. All this time we spend looking at ourselves through filters and editing our photos is starting to affect to us. The issue is, that when we are constantly seeing a “better” version of ourselves on our screens and receiving praise for that version on social media, we start to believe that maybe that’s what we really ought to look like. Not only can this damage self-esteem, but some people take this so far that they are reaching out to cosmetic doctors to “fix” the flaws they are seeing in themselves. Doctors call this phenomena Snapchat dysmorphia, and the American Academy of Facial Plastic and Reconstructive Surgery reported in 2017 that “55% of surgeons report seeing patients who request surgery to improve their appearance in selfies”. Snapchat dysmorphia is sparking a larger conversation surrounding beauty standards, especially in teens and in 2019 this inspired the British photographer Rankin, to create a project called Selfie Harm. Rankin asked British teens, ages 13-19, to edit a photograph he took of them until it was what they considered “social media ready”. The results were astounding; in just five minutes many of these girls significantly altered their appearance for what they believed was better. Rankin stated that "this is just another reason why we are living in a world of FOMO, sadness, increased anxiety, and Snapchat dysmorphia," and that it is “time to acknowledge the damaging effects that social media has on people's self-image." Wondering if your child might have social media FOMO? Beyond what selfies are doing to our self-esteem, they can also be physically dangerous. A study from the US National Library of Medicine reported that between 2011 and 2017, 259 people were killed in an attempt to take extreme selfies. People are taking risky selfies on top of buildings and mountains, on the edges of cliffs, and near dangerous bodies of water in an effort to win more likes on social media. Researchers in this study believe that there are likely more selfie-related deaths that go unreported and that this issues needs to be addressed suggesting that “no selfie zones” should be introduced. 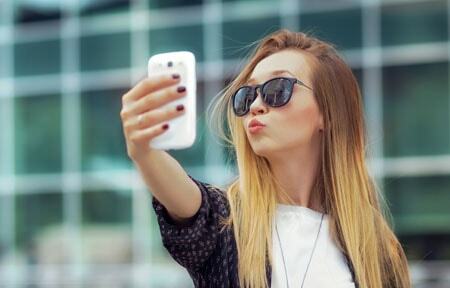 There is no denying that selfies are a lot fun, but selfies and selfie addiction can lead to bigger issues and adults and teens alike need to know where to draw the line. If you took this quiz yourself or took it with your child and scored pretty high, consider why you feel the need to take so many selfies. Selfies can truly be harmless, but it’s worth considering opening a broader discussion in your family about the impact of social media and photo sharing and editing apps. Parental control software like Net Nanny can help your family assess and limit how much time your children are spending online and on social media with screen time tools and detailed reporting about your child’s online activity. Your kids likely aren’t getting offline any time soon, nor will they stop taking selfies but striking a balancing and using tools like Net Nanny can make for healthier internet use. Learn more about the parental controls that Net Nanny can offer your family.